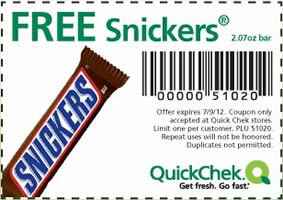 FREE Snickers Bar at QuickChek! This week's QuickChek freebie is a good one! Bring this coupon to your local store to score a free Snickers bar! Expires 7/9/12.